It is much easier to say what is the same. The conductor is the leader. 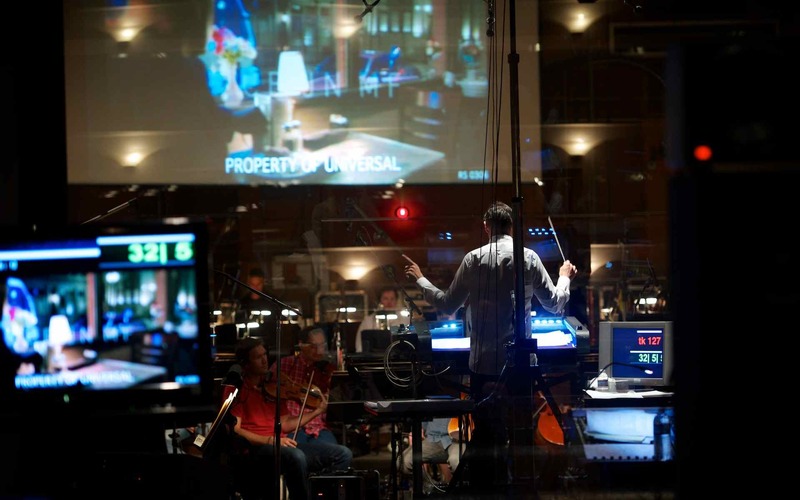 Whether recording or performing live, the conductor’s job is to beat time and cue people. That is about where the similarities end, however! In a concert hall scenario the music has usually been played many times before and the players know it. In the studio we are always sight reading, even the conductor. We make changes, sometimes lots of them. Being able to communicate and manage these is one of the essential talents of a studio conductor. A lot of people have input into how the music should go, including the producer, director, composer, and orchestrator. The conductor has to distill this variety of input into succinct and effective instructions for the orchestra. I think the best way to explain what I do is to give a rundown of what happens at typical session. I like to get to the scoring stage at least an hour before we start. If it is a large orchestra and I have not seen the music I will get there even earlier. In many cases I do not get to see the scores until the session, so this is my first chance to look at them. 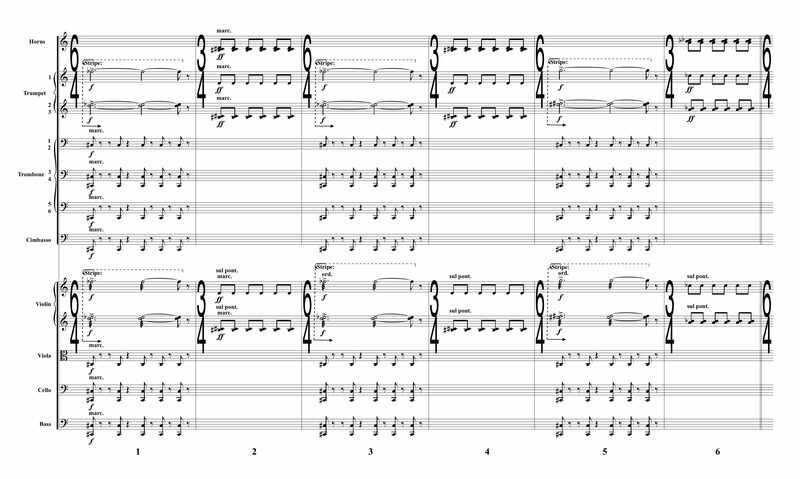 As most scores are hybrid, I will also grab some mockups and have a listen. I have a simple three-color system for marking up scores: tempos in purple, cues in green, and notes from the booth in blue. The colors are not important, any three will do. I look for tempo markings first. If they are not above the string section I will mark them there as well as highlighting them on the top of the score. For tempo changes I mark them as + or – in bpm. For example +3 would mean we get faster by three beats per minute. This is a much better system than saying ‘slightly faster’, as I have no idea how much ‘slightly’ is. If free clicks (the count-off to the start of recording) are not marked already, I will also decide those. A general rule: below 85 bpm, four free is enough; above use eight. Going into 3/4 I use six free unless the tempo is very slow. If we are going into a groove or riff in something like 5/4 or 7/8, I will have a bar or 2 in that meter. However if that time signature is just because the music needed to fit that space and it is not really ‘in’ that meter, I will just use 4 or 8 depending on tempo, as it is much easier to feel. You need enough time for the players to get ready and absorb the tempo. Too short and someone will miss the entry, or you will have a noise just before the music starts as players scramble to get their instruments up. Too long, and frustrated players will not get ready soon enough, and then there will be noise when they do anyway! I will make note of any tempo changes. If there are sudden ones or ritards etc I will often play them to the orchestra before we try to play it. Small tempo changes tend to float by. The orchestra generally reacts as a pack to them. But if you need them to be really on with a change I will mention it. This is very important when we have to line up with a track. It takes 2 clicks to register a change, so they will never line up on the 2nd one perfectly on the first take. If it is a drastic ritard, or we are already going slowly, I might decide to put in 8th note clicks for a few beats. I am also looking for places where we may need to stop and start again, or do a ‘pickup’ (more on these in Part 2). Here are some examples of things that might come up, why they present potential issues, and my tips and tricks for getting around them. I guarantee this is not covered anywhere else! The horns and low brass will come off on 4 at the end of bar 25 in order to breathe before 26. The trumpets will not end early, as they do not play in 26. 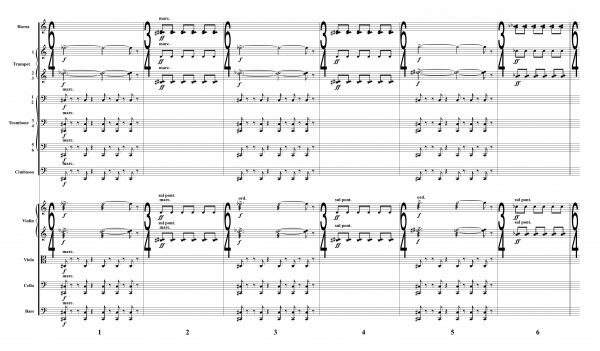 I will need to tell the trumpets to add a comma to the end of the bar so they end at the same time as the others if they don’t hear what the others do after the first take. If we do stop there I will have to decide if I want all of them to put the comma as if there were playing on, or go to the bar line. If I say nothing, they will go to the barline. Bar 26 will have more impact if there is a little gap before it, whether we need it or not, so I will most likely have them add the comma. Violin I has to cross from the E string to the G string. They will end the Bb early in order to get to the G string for the beginning of bar 26. The top part of Violin II also has to cross strings; however, the bigger problem here is that going from a tremolo to a motor rhythm is impossible to do in perfect time without leaving a gap. There is no way that this will be tight unless they end the tremolo at least a whole beat early, and even then it is very hard to pull off. Viola will also break between bars 25 and 26 as they ‘charge’ the bow for the marcato. With a beat rest none of the above would be a problem, and if this were a concert piece that would naturally happen and no one would notice. But in the studio we might have tracks to line up with and synths that do not naturally breathe. The picture may require us to sustain to the barline, or the composer and director may want the live session to follow the sound of the mockup, so these things become issues. The solution in this case is to cheat and do a pickup from bar 26. Also note that sonically we are used to hearing the brass ‘throw the note out’, take their breath, and then play, making a bit longer gap than the strings might do or need. In the big picture you will not notice this. Even if crossing strings and articulations weren’t problems, there is still a tempo change that will make it impossible for the violins to line up with the click and each other in bar 26. This alone is grounds for doing a pickup for 26. If the tempo is slow, around 80 bpm or lower, and there are motor or syncopated rhythms, I will make a note to use eighth note clicks. I will tell the Pro Tools operator right away so they can prepare the click track. In the example above, I would ask them to prepare 8 clicks into 26 in the new tempo. The next example presents similar issues, but a different solution. While this is possible, it will be challenging. Bar 1 to 2 is fine, but 2 to 3 presents accuracy issues due to the leap. There is a risk that the last note on bar 2 will suffer or the entry on 3 will. The best way to record this is to leave out bars 2,4, and 6 and record them on a separate pass. This makes it a very easy passage to record. As I mentioned in the previous example, it is tough for string instruments to quickly go from unmeasured to measured bowing. There is a little gap, but it still could be risky. You also have a similar issue to the trumpets where there is a leap, but this is less of a problem in this range on the violins. Again the same solution works though. Record the tremolo bars, then on another pass play the other bars. This is not counted as overdubbing as they are not playing on the same place twice. We are just cheating a little to get more precise playing. I had actually orchestrated this example myself and thought ahead as to how we would record and marked accordingly. I used ‘stripe’ to notate that it would be recorded separately. 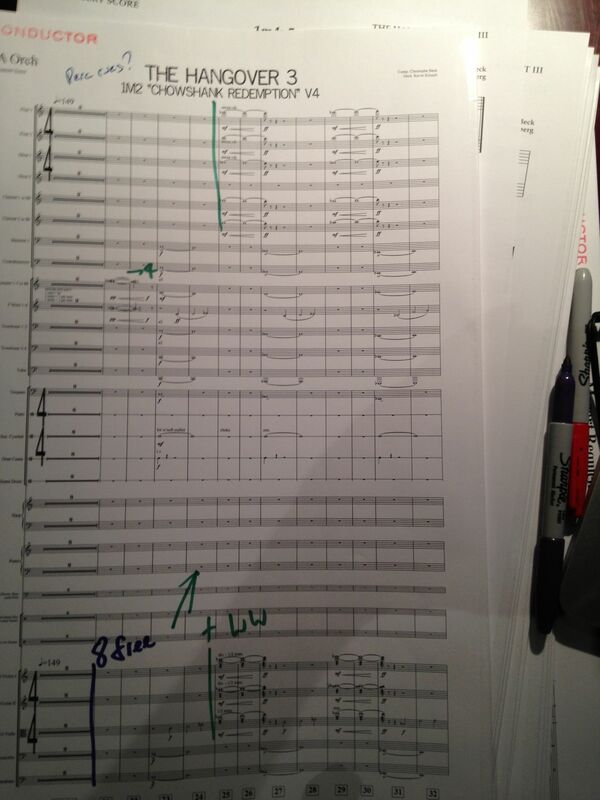 If the score has a rhythm section or percussion pre-lays, I make note of where we have to groove with them. 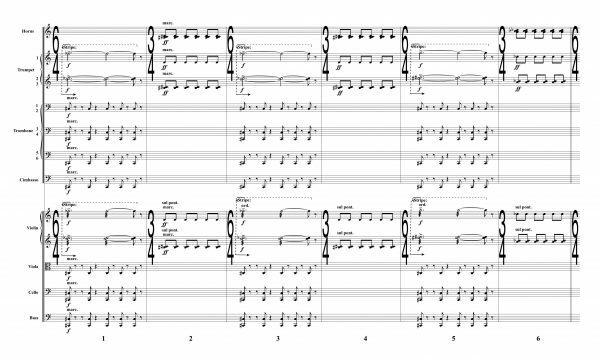 In general, the orchestra is happiest listening only to a click track, but if there is a groove we have to play with, we might turn it up for that section. 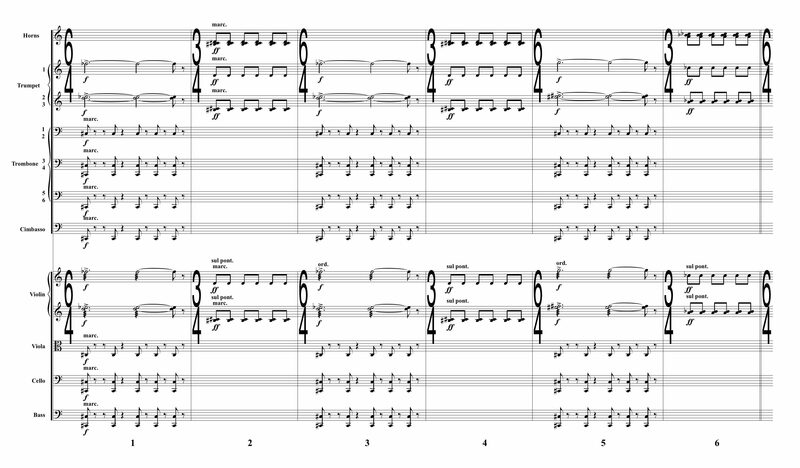 Sometimes I will have the orchestra listen to the track before we play it and point out what we have to line up with. We often do a take or two playing with the track then we turn it off to the players so they can concentrate on the click. You have to remember that they are not listening to a lovely hi-fi stereo version of the track, they have a mono version mixed, sometimes badly, with a click, fed into lo-fi headphones. Hence my experience that they are happiest and perform best just with the click. It is also my job to make sure we sonically mesh with the track. Yes there are other people in the booth listening as well, but they will also be concentrating on the picture. For example, if we are playing with a lot of ambient synthy drones, I will want minimal vibrato. If there are synth hits in the track, I have to make sure our attack and length match perfectly. I check for any mute changes in the strings and check with the concert master to see if they have page turns. I have banned page turning during takes! Someone will nearly always make some noise, and if it sounded as good with half the section playing while the others turn pages, we could save a ton of money and just book half the players! 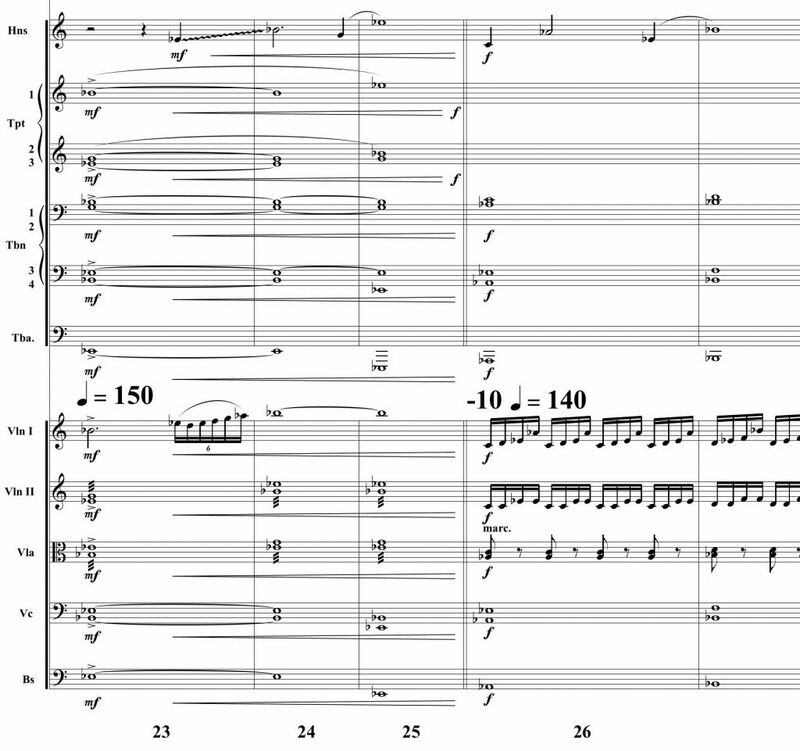 As the violins are copied on the same part, the violins will have more turns than any other section. The solution to both the mutes and page turns is to stop and pickup again after the change or turn. You won’t notice in the theatre how many times we stop and start, it is not like a concert hall. I mark major entrances I would like to cue in green or more recently I have been using an orange highlighter. Players in our sessions tend not to get lost, and since they are sight reading most of the time, their heads are often buried in their parts. Despite all that, if you can cue a player before a solo or big entry it is beneficial. If the entry is in the woods or the brass, I might draw an arrow from the strings as that is where my eyes are most of the time. I will also look at phrases. If there is an obvious four bar phrasing going on, I will write a big ‘4’ in the middle of the phrase so I know I can look around the room for four bars. Same for six or eight etc. The more I look at the players, the more they look at me. If your head in buried in the score and never look up, the players will not feel much need to really ‘look’ at you. They can see the beat peripherally. By now the players are arriving, so I will say hello to my friends and try to make it around to meet anyone new. Then I will grab my pens (I have ditched pencils in favor of erasable ink pens, much better and they never break or go blunt) and scores and head to the podium and set up my headphones. I use ear canal type headphones. I have these just sitting in my ears so I can hear the click and the tracks but can also hear the room naturally. I see most people using large, over the ear headphones when they conduct. I do not see the point in this; if you have both ears on, they are uncomfortable, they take you out of the room, and you spend all day taking them on and off. If you have only one ear on, they are even more uncomfortable and block out half the room, so you never can tell where a question is coming from. They can also create quite a lot of noise, especially when not square on your head. I will tell the monitor mixer what I would like in my own headphones, which is usually just click, some harp, woods, and any tracks we may have to play to. While I get this set up, the contractor will bring me a list of principals’ names. Usually I know them all, but this is invaluable if you do not know the orchestra. It is much better to talk to players by name. I tend to address sections by the name of the principal too. 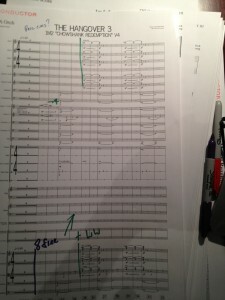 Depending on who the composer and team are, they may have a recording order ready. Others rely on me to come up with one. Once all the setup is complete, we are ready to record. Read on in Part 2. Hear hear. It’s too bad banning page turns during the music isn’t practical in concert settings too, but it’s wild to me that composers are commonly so lackadaisical about it as to be okay with losing half the section in places they didn’t mark and that are chosen based on a concern that has nothing to do with the way the music sounds. It seems at least as bad to me as writing wind music that doesn’t take into account the need to breath, but gets much less recognition as such. do you mean punching in with the recording starting at bar 26? When you conduct, how important are your music (sight) reading skills? I studied classical guitar at the conservatory of music a long time ago, anything other than the G cleff still makes me pause for a second; never mind transposing instruments where I literally have to look at transposing tables and write down the note names to figure out what’s going on. Sibelius is fantastic in getting everything correct on paper with automatic transpositions, using the right cleff etc., but obviously when you’re on the stand you are on your own. I can usually tell when something is off but in some modern music, e.g. with free tonality, it is sometimes really hard to tell and if a horn player would hit a wrong note I might never notice. Can I just trust that the players are top pros who will get it right and will correct themselves, so I can focus primarily on the ‘big picture’ (the overall score and the film)? I generally do not have to worry about them hitting the wrong note and intonation problems usually sort themselves out. I spend more time tightening rhythms and working on the ends of phrases. But I do have be able to find wrong notes in the score or make changes, re-orchestrate or even compose something on the fly so being at one with the score is important. Plus, if the players started to doubt your abilities, you could lose them. But many people hire me (or any conductor or orchestrator) to help them through. Knowing the orchestra inside and out is not a pre-requisite for landing a major score these days. So, I would not worry about it, but if you were to do an orchestral gig, maybe get another conductor or have someone in the booth who has the skills you don’t so if something does come up, it can be sorted. This is a really insightful read, Tim! I have a question about your color codes. Do you ever mark dynamic changes (i.e. hairpins, diminuendos, crescendos, fortes, piano, etc)? What is your reasoning for leaving that out of your color codes? Hi Jeremy, good question. I have found that if I go crazy marking up everything, the score ends up a mess. We make a lot of changes. Even the best orchestrators can not totally get inside the composers head and nail every dynamic so it is really common that dynamics and hairpins get massaged, sometimes several times. I like to keep the score clean so when I put the changes in, I am not having to get rid of my redundant ones. The one time I will mark it is coming into a page turn. If the next section is a dramatic change in dynamic, I will mark it so I know how to lead them into it and don’t look like an idiot when it goes to solo flute and I am still asking the strings for more!